WACV 2018 will he at Harvey’s Casino and Harrah’s Casino in Lake Tahoe NV right at the NV/CA border. They are connected (without going outside) and are both walking distance to Heavenly ski resort. Harveys Lake Tahoe in the South Shore area is the largest resort casino in Lake Tahoe and features over 700 beautifully appointed rooms in two ultramodern hotel towers. Beyond the comfort and luxury of its accommodations, Harveys Lake Tahoe offers guests a variety of amenities and exciting entertainment options. Hotel guests can enjoy live entertainment from the hottest artists at the Cabo Wabo Cantina or stop by The Improv at Harveys Cabaret for a laugh. For the late-night crowd, the 19 Kitchen * Bar located on the hotel’s 19th floor serves up fantastic food from an eclectic menu along with spectacular panoramic views. Or head on over to Hard Rock Cafe Lake Tahoe for dinner, drinks and great music amid rock ‘n’ roll memorabilia-laden walls. The lobby level features an array of gift shops, a beauty salon and a video game arcade the kids will love. After a long day on the slopes, guests can work out in the resort’s state-of-the-art fitness center or wind down at the 52,000-square-foot casino, year-round heated pool or oversized hot tub. Guests will be charged a resort fee of $20 per room, per night upon check-out at Harveys. The resort fee gives the guest: in-room Internet access for two device per day, access to Harveys Health Club for 2 people per day, 24 hour access to Harrah’s Fitness Center, access to Harveys outdoor pool and Harrah’s indoor pool, both with Hot Tub, local Telephone Calls, valet Parking, ski, luggage and golf club overnight storage and a noon Check Out. AAA Four Diamond Award-winning Harrah’s Lake Tahoe is centrally located on the South Shore of Lake Tahoe and reflects the natural beauty of the surrounding Sierra Nevada. Every one of Harrah’s 525 rooms has been designed with the ultimate in guest comfort in mind. Each standard room in the 18-story hotel is deluxe-sized with more than 500 square feet of living space and includes a roomy sitting area, his and her bathrooms, a refreshment center and more, with your choice of a king or two double beds. Hotel guests can dine at six exceptional restaurants, relax by the sparkling swimming pool and spa, or test their luck at Harrah’s first-rate, world-famous casino. Harrah’s Lake Tahoe is just moments from skiing and snowboarding at renowned Heavenly Mountain Resort, golfing on a number of nearby championship courses, biking, hiking, shopping and much more. 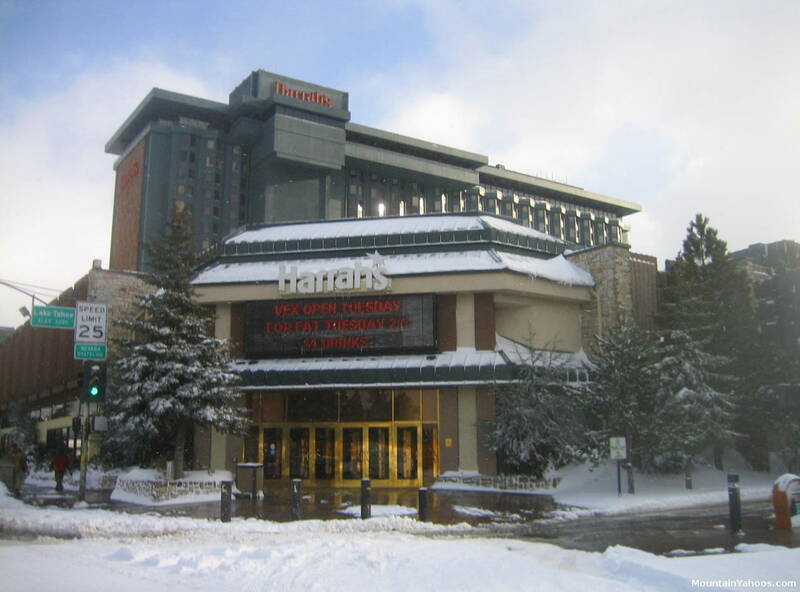 Guests will be charged a resort fee of $20 per room, per night upon check-out at Harrah’s. The resort fee gives the guest: in-room Internet access for one device per day, access to Harveys Health Club for 2 people per day, 24 hour access to Harrah’s Fitness Center, access to Harveys outdoor pool and Harrah’s indoor pool, both with Hot Tub, local Telephone Calls, valet Parking, ski, luggage and golf club overnight storage and a noon Check Out. Please note that you must be 21 years old to check in to Harrah’s.